“Le Logge di Silvignano”, a majestic ancient Villa of the ‘Contado di Spoleto’, is in a dominating position on Monte Poreta, began construction in the 11th century A.D. In the 14th century, a fortified wall was built around it for defence against armed bands. The residence is one of the most important examples of medieval architecture in the region, a magnificent rare 15th century lodge with octagonal-columned arches decorating the façade. The spirit of this ancient residence, which still conserves a votive shrine with splendid 15th century frescoes, is matched with elegance, comfort and modern refinements, conserving and enriching its original architectonic elements. The suites and spacious mansards, all different, have wooden beams, arched or crossed-arch stone ceilings, hand-made terracotta flooring, and some also have ancient fireplaces, terraces or private gardens. The atmosphere of long-ago times can be seen not only in the antique furnishings, made out of wood or wrought-iron by local craftsmen, but also in the precious artwork ceramic ware and in the family’s antique possessions which all complement the warm and welcoming hospitality. 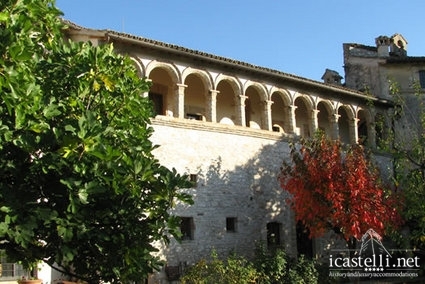 From this suggestive base, guests can discover the wonderful Umbrian surroundings, a fascinating territory with a lot of history including the nearby city of art, Assisi, small villages and medieval castles to explore and admire, going back in time to an era of great ostentation and culture.